There’s a few constants in life – taxes, weather changes, and eventual death. But did you also know that something Kyoryuger related is also released on a yearly basis? For the fifth year in a row, and four years since the series premiered, we have something new from the fan-favorite Zyuden Sentai Kyoryuger! In partnership with Brave Frontier 2, which releases for mobile in Japan on February 22nd, the cast of Zyuden Sentai Kyoryuger has come together again with a special promotional episode titled “This is Brave! The Battle Frontier!”, numbered as 33.5. You can check out the episode below! We expect it to be subtitled sometime soon. Leading up to the February 7th TV premiere of Power Rangers Dino Charge, TokuNation has prepared another serving of Zyuden Sentai Kyoryuger for your viewing pleasure! Continuing our new series of Gallery 2.0’s today we’re bring you S.H. Figuarts Kyoryu Blue & Kyoryu Green! These fantastic figures are based on the equally excellent Kyoryu Red mold, though Kyoryu Blue & Green were released as a Tamashii Web Exclusive 2-pack. Because of this they’ve become a bit harder to find for a decent price and have seen a significant increase in demand. But don’t let that deter you. S.H. Figuarts Kyoryu Blue & Green share Kyoryu Red’s excellence in accessory count, sculpt, and articulation. It’s like getting a double dose of fantastic figures loaded down with best accessories they could possibly have. But definitely take a look at this gallery if you need some convincing. We’ve attached a selection of images to this post, but feel free to peruse 80 images of this two pack by clicking “Discuss on the TokuNation Forums” at the bottom of this post. We’ll be back soon with a nother gallery 2.0 as well, S.H. Figuarts Kyoryu Black & Kyoryu Pink! December magazine scans have just been released and we’ve got another round to post! This time we’re looking at Ressha Sentai ToQger episodes for December! It’s beginning to look a lot like Christmas for the ToQgers as Emperor Z plans the usual holiday mischief Sentai villains get up to. It looks like the Emperor may have gained a new powered up form for the holidays as well. General Schwarz will come face to face with the Emperor once more and it appears a doppelganger Zaram or TOQ-6 are on the loose too, a 3 way battle between ToQ-1, TOQ-6, & Zaram?! It’s coming! 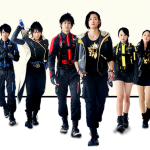 On the ToQger VS Kyoryuger Movie front we have confirmation that all 6 main Kyoryugers will have primary roles in the film. The enemies for the film have also been revealed as the new Deboss generals Salamaz & Devius, along with Clock Shadow. 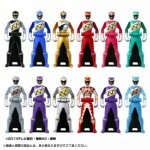 The ToQgers will also be reverted to their child forms but still capable of transformation! 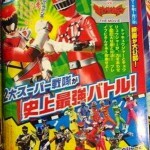 The Kyoryugers will also be bringing the gigantic Brave Zyudenchi to the mix, seemingly it can combine with Red Ressha! 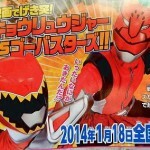 Ressha Sentai ToQger VS Kyoryuger : The Movie hits theaters January 17th 2015! Ressha Sentai ToQGer VS Zyuden Sentai Kyoryuger Announced! The team-up train keeps right on rolling! 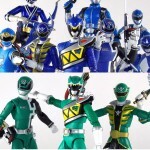 Toei has officially confirmed their newest Super Sentai team-up: Ressha Sentai ToQGer VS Kyoryuger THE MOVIE! The special will be released in theaters on January 17, 2015! No other details are known at this time, so stay tuned to TokuNation as we keep you up to date! Welcome to the first of many Power Rangers Mondays here at TokuNation.com! Every single Monday we will have an article focused on all things Power Rangers. Whether it be relevant to something in the news or fun facts or even just something off the wall, we’re committed to bringing you something fun and interesting to read about Power Rangers! We’re kicking off our first Power Rangers Monday in style with an article focused on the upcoming series Power Rangers Dino Charge, which is to be an adaption of the popular Zyuden Sentai Kyoryuger series. And what better way to start off that whole area of discussion than with an article all about adaption – namely, our list of what we consider the Top 5 Things We Want to See Adapted from Kyoryuger. So charge those batteries and brave in to our article by clicking “Read More”! And once you’re done, join the discussion and tell us what YOUR top 5 things are that you believe should be adapted. Enjoy! This certainly has been a busy month hasn’t it? In the last few weeks we’ve had some big news pop up for the franchises we cover here at TokuNation. Godzilla movie updates, a new Ultraman series on the horizon, the always awesome Super Hero Time combo of Gaim & ToQger, and the ever controversial Power Rangers Super Megaforce! Well among all that news you may have missed some of our awesome gallery updates brought to you by the fantastic Tokunation Photo & Content Staff! Follow the links below to be taken to any of our most recent galleries and feel free to leave your comments! Check out this video showcasing this Ranger Key set below! Are you planning to pick up this set of Ranger Keys? Can you even afford it? And how about that sweet looking Torin key? Remember – this is probably the only way to get Ranger Keys for what will soon be known as Power Rangers Dino Charge, so if you’re a collector it wouldn’t hurt to start looking for the cheapest one you can find! After tons of teasers, short previews, images, and casting news we finally have the full minute long trailer for Zyuden Sentai Kyoryuger vs. Go-Busters: Great Dinosaur Battle! Currently the video is only being hosted at Kyoryu-gobus.jp so you’ll need to follow this link to check it out. New Promo for Kyoryuger VS Go-Busters & Returning Dinosaur Sentai! The second promo for upcoming crossover special “Kyoryuger VS Go-Busters” is now online, highlighting the return of other Dinosaur Sentai heroes from Zyuranger and Abaranger! This time last week saw plenty of photos from the Tamashii Nation 2013[/URL] event in Japan, with certain figures such as the forthcoming Kamen Rider Gaim S.H. Figuarts only getting through with blurry images. Check out the full selection of images by clicking here!